In medium bowl, mix chicken, ricotta cheese, garlic salt and red pepper flakes; stir in 1/4 cup of the basil. Spoon into quart-sized resealable food-storage plastic bag. Cut 3/4 inch tip off bag. Pipe filling into manicotti shells. Spray 5-quart oval slow cooker with cooking spray. In medium bowl, mix pasta sauce and water. Spread about one-third of the sauce mixture in slow cooker. 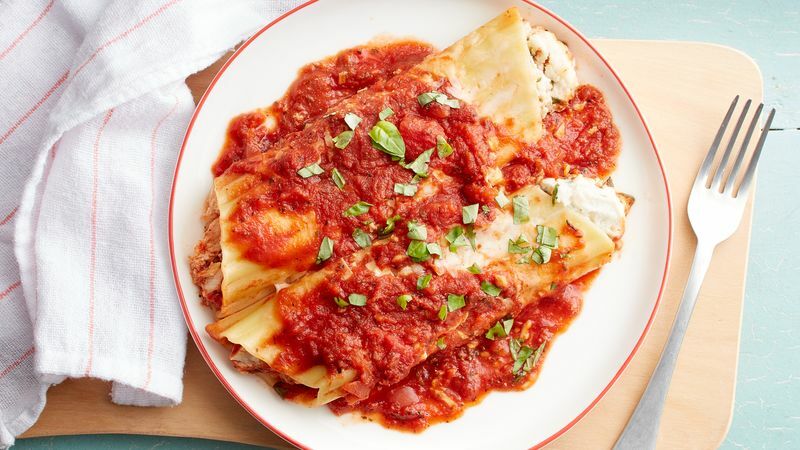 Place 7 of the filled manicotti shells in pasta sauce. Sprinkle with 1 cup of the mozzarella cheese. Spoon another one-third of the sauce mixture over shells. Top with remaining 7 filled manicotti shells; sprinkle with remaining 1 cup mozzarella cheese. Top with remaining one-third of sauce mixture. Cover; cook 2 to 3 hours on High heat setting or until shells are tender. Serve with remaining 1/4 cup basil. Rotisserie chicken is a great shortcut for this recipe, but any cooked chicken or even leftover turkey will work well. Like it hot? Use 1/2 teaspoon crushed red pepper flakes instead of 1/4 teaspoon.